In The Golden Child, Eddie Murphy plays Los Angeles social worker Chandler Jarrell, who is tasked by the priestess Kee Nang (Charlotte Lewis) to travel to Tibet to save the Golden Child (J.L. Reate)—someone believed to be a bringer of compassion that walks among us every thousand generations—from bad guy Sardo Numspa (Charles Dance). Here are some facts about the film on the occasion of its 30th anniversary. 1. IT WAS MEANT TO BE A "RAYMOND CHANDLER WITH SUPERNATURAL ELEMENTS" FILM STARRING MEL GIBSON. Writer Dennis Feldman (Just One of the Guys) wrote a screenplay called The Rose of Tibet, a "Raymond Chandler movie with supernatural elements." Feldman later said that what would become The Golden Child (1986) "was intended to be played very straight by Mel Gibson, but Eddie Murphy loved it, and took it." 2. EDDIE MURPHY CHOSE IT OVER 20 OTHER SCRIPTS. The red-hot comedian was coming off of 48 Hrs. (1982), Trading Places (1983), and Beverly Hills Cop (1984) when he chose The Golden Child over approximately 20 other projects in development at Paramount specifically for him. Though John Carpenter was offered the chance to direct The Golden Child, he preferred the somewhat similar script for Big Trouble in Little China (1986), starring Kurt Russell. "The films have a similar theme in that they both explore Chinese legend and magic, but they develop in different ways," Carpenter said. "Golden Child is a very fine script. It has its problems, but it also has one big plus—Eddie Murphy. It will be hard to pull off that script. But if they do, it could be a wonderful movie!" 4. CARPENTER RUSHED TO BEAT THE GOLDEN CHILD INTO THEATERS. In order to beat The Golden Child into theaters, Carpenter limited his prep period on Big Trouble in Little China to 12 weeks to make sure his movie came out in July 1986, five months before Murphy's movie. 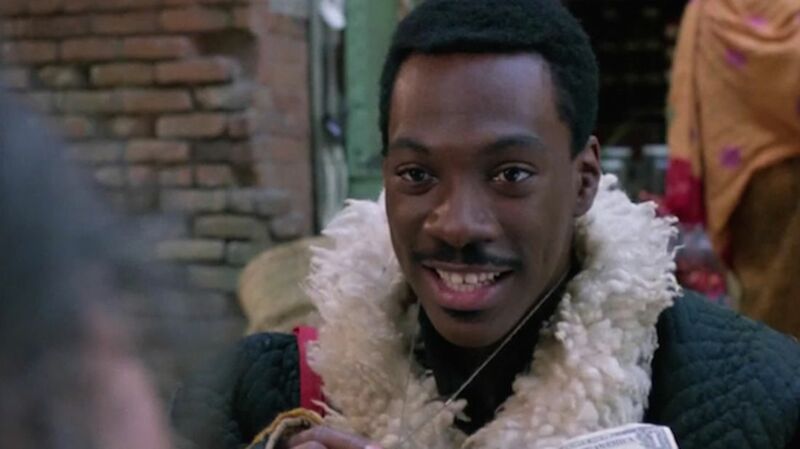 "If Big Trouble were released at the same time as Golden Child, we would be killed at the box office because audiences love Eddie Murphy," Carpenter said. Opening on the 4th of July, Carpenter's film made $11.1 million, while Murphy's made over $79.8 million. 5. MURPHY MET WITH GEORGE MILLER ABOUT DIRECTING IT. While Murphy was an "avowed fan" and met George Miller at least twice about directing The Golden Child, the actor decided to go in a different direction. Michael Ritchie (The Bad News Bears, Fletch) ended up with the gig. 6. THE GOLDEN CHILD WAS A 6-YEAR-OLD GIRL WITH A SHAVED HEAD. The titular character was a Tibetan boy, but 6-year-old Jasmine Reate got the job. She had her head shaved and was credited as "J.L. Reate" to hide her true gender. 7. A WORLDWIDE SEARCH WAS HELD TO CAST KEE NANG. There was a "global effort" focusing on London, Bombay, Hong Kong, and United States talent. Out of 500 applicants, producers and Murphy's manager ultimately went with teenage model Charlotte Lewis, who had only ever appeared in one film—Roman Polanski's Pirates (1986), which came out six months before The Golden Child. 8. YELLOW DRAGON WAS PLAYED BY KIRK DOUGLAS'S SON. The Golden Child was one of nine movies featuring Eric Douglas. The actor and stand-up comedian passed away in 2004. 9. THE ACTORS WEREN'T IN NEPAL. A second unit team did film in Nepal, but most of the movie was shot on Paramount's soundstages in Los Angeles. The Himalayas were recreated at the Mammoth Mountain ski area in Mammoth Lakes, California. 10. THEY UTILIZED NEW SPECIAL EFFECTS TECHNIQUES THAT WERE DEVELOPED FOR WHO FRAMED ROGER RABBIT. "The Tondreau system," developed by Bill Tondreau, was described by American Cinematographer as "a live-action motion-control system which enables any camera move to be recorded on floppy disc; where the information is stored for playback later at the (George Lucas' Industrial Light & Magic) facility, and can be repeated exactly ad infinitum." Ken Ralston, the visual effects supervisor, said the tests for Who Framed Roger Rabbit (1988) went so well that they decided to use it on The Golden Child first. "It was like initiation by fire," Ralston said. "We were still doing our tests up here while we were shooting our plates down there in L.A., and it was a race to get everything set. We had our fingers crossed all the time, but we pushed the system as far as we could." The Los Angeles Times reported that the special effects were not completed until a few days before the film opened. One scene the ILM crew had "fun" with was the Pepsi can dancing to "Putting on the Ritz." 11. THEY ADDED SCENES IN POST-PRODUCTION TO MAKE IT FUNNIER. Post-production on The Golden Child was extended due to several last-minute tweaks to the film, including attempts to give it more of the humor that audiences had come to expect from an Eddie Murphy film. Producer Robert D. Wachs told the Los Angeles Times that a handful of short scenes were added, noting that "Some of the jokes just needed buttons." 12. THE MUSICAL SCORE WAS SWITCHED AT THE LAST MINUTE. Also adding to the film's long post-production period: The film's entire score was replaced at the last minute. Originally, Oscar-winning composer John Barry (Out of Africa, Dances With Wolves) was hired to score the film, but the reaction to it was not favorable. According to Wachs, Barry's score "was magnificent but the research told us it did not move the picture along." So Michel Colombier was brought in to create something more contemporary. 13. CHARLES DANCE WAS DISMISSIVE OF THE FILM. Charles Dance—who played Sardo Numspa in The Golden Child, but is perhaps best known today as Tywin Lannister on Game of Thrones—said he enjoyed improvising and acting with Murphy, but admitted that he didn't think much of The Golden Child. "It wasn’t a great intellectual exercise, but it was great fun," Dance told the Los Angeles Times. 14. THE WRITER CALLED THE FILM "A NIGHTMARE." Screenwriter David Feldman didn't think Michael Ritchie did a great job with the film. "You had to get in there and make this action/adventure/detective film, but instead, everybody wanted to make an Eddie Murphy comedy," Feldman opined. "I think that wasn't what Eddie should have done, and it's not what the director should have done—and he didn't even do it that well, either. It was a nightmare."